When reviewing the statistics i calculated above based on the data entered in the spreadsheet, it’s good to be aware that averages tend to hide underlying variation. That’s why it’s always advisable to also take into account other measures such as the median and also the minimum & maximum values to get a sense of the range of the scores. The second chart features an additional macro-regional breakdown into “Upper Guinea”, “Lower Guinea” and “Central Africa” which is of my own making. Making this distinction is admittedly arbitrary and can only produce a rough proxy, given the limitations of AncestryDNA. Still I find it useful because you get to see some patterns more clearly and it conforms with what’s common in slave trade literature. For ethnolinguistical and historical maps from these 3 main regions of provenance see: Upper Guinea, Lower Guinea, Central Africa. “Ghana/Ivory-Coast, “Benin/Togo”, “Nigeria” and “Cameroon/Congo” are the most significant regions reported for Anglo-Caribbeans sofar. The high “Ghana/Ivory-Coast” and “Nigeria” scores were to be expected because of what we know from documented slave trade as well as cultural retention in the English speaking West Indies (see also this overview of charts specifying the ethnic/regional origins from the Anglo-Caribbean). 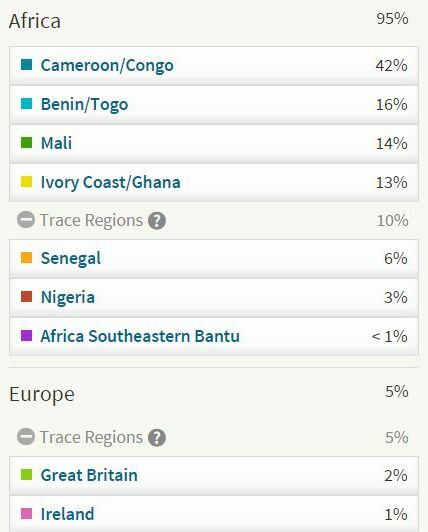 The “Cameroon/Congo” percentages could very well reflect more so Bight of Biafra ancestry than strictly Central African ones on average, but this is impossible to tell right now for individual cases. 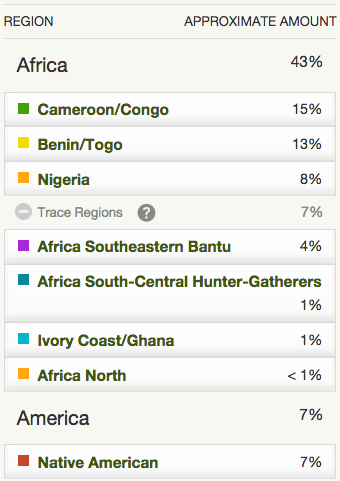 (see also AncestryDNA regions, and Igbo results showing high levels of “Cameroon/Congo”). The high amount of “Benin/Togo” is most surprising and actually also observed among African Americans, going against what you might expect. It’s possibly because this region is also signalling ancestry found outside of Benin/Togo, for more details see “Benin/Togo Region“. I’ll also discuss this finding specifically for Jamaica in the next paragraph. Based on the results sofar Anglo-Caribbeans might possess the highest degree of Lower Guinean (Ghana-Nigeria) ancestry across the Afro-Diaspora, (see also Afro-Diaspora AncestryDNA results: A Comparison and similar findings for Barbados in this study). It is true that the full range of Afro-diasporic origins (from Senegal to Mozambique) is documented for the West Indies and also already confirmed by these AncestryDNA findings. But it seems that 60-70% of their total African ancestry on average might be coming from places located in between Liberia and Cameroon, and mostly from Ghana-Nigeria. Which is a clear majority and gives their African breakdowns on AncestryDNA a more distinct and regionally concentrated character. Of course the distribution of actual ethnic origins within the greater area of Lower Guinea might vary. Even more so than for the Haitian results i’ve seen it seems that Upper Guinean roots (“Senegal”+ “Mali”) are greatly diluted for Anglo-Caribbeans. Especially “Senegal” is often not reported at all. 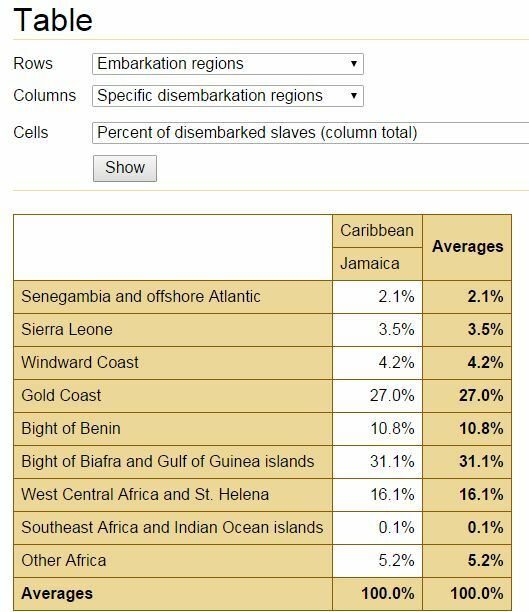 The 2.7% average “Senegal” for Jamaicans being remarkably similar to the reported share of Trans Atlantic slavevoyages from Senegambia to Jamaica of also about 2% (see chart below). However there are a couple of higher “Mali” scoring outliers. “Mali” might be suggestive of genuine Malian origins, by way of Gambia. However given the imperfections of the current AncestryDNA Regions, i suppose “Mali” could very well also signal origins from Burkina Faso or the northern Gur-speaking parts of Ghana/Benin/Togo. Aside from other options (Guinea Conakry/Sierra Leone). The “true” extent of Central African origins for these West Indian results is more difficult to establish because of the ambigiously designed “Cameroon/Congo” region. However the average “Southeast Bantu” scores are among the lowest compared with other parts of the Afro-Diaspora. Even though there are a couple of higher outliers, perhaps indicative of more recent lineages hailing from the socalled contract labourers recruited among Liberated Africans in the mid 1800’s. Also the “South Central Hunter Gatherers”, a.k.a. “Pygmy/San” %’s are even more minimal than elsewhere, especially for Jamaicans. Assuming these two regions will be correlated with total Central African heritage for West Indians, this might therefore also be subdued relatively speaking. But still noticeably present. The samplesize for the Belizeans is very low but it’s perhaps interesting to note already that as expected the main variation of Jamaican results is being followed by the Belizean results. Many or even most African captives in Belize arriving by way of Jamaica, it can be assumed that their African origins are a reflection of the ones for Jamaica, or perhaps even a subset because of founding effects and timing of arrival. The samplesize for the Guyanese is even more limited. However based on the results sofar Guyanese origins from the “Ivory Coast/Ghana” region might be quite substantial and consistent indeed. Probably more so than for other parts of the West Indies this region could also signal genuine ancestry coming from within the borders of Côte d’Ivoire or even Liberia for Guyanese. Guyana being supplied by Dutch slave traders for the most part throughout the 1700’s and the Windward Coast being relatively more frequently visited by them than other Europeans (see upcoming blogpost). Jamaican AncestryDNA averages: confirmation of estimated regional roots? Source: “The African Lexis in Jamaican: Its Linguistic and Sociohistorical Significance” (Farquharson, 2012). 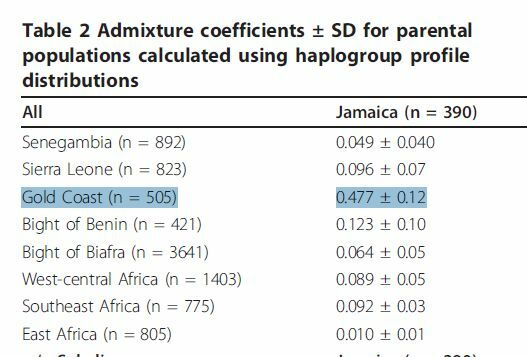 Again i like to stress the number of Jamaican results i managed to collect (n=19) is very small. This samplesize cannot be expected to be fully representative for a population of more than 4 million people (incl. diaspora). What’s about to follow below should therefore not be taken as a final verdict on the ancestral makeup of the whole Jamaican population. However as the results are randomly picked and from several different parishes within Jamaica they could still be a rough indicator of the scope of African origins in Jamaica as well as its main tendencies. Jamaica’s African heritage is often associated with Ghana in popular imagination because of cultural retention. As shown by the AncestryDNA averages and also a selection of results shown below, Jamaicans are firstmost showing a melange of ethnic/regional origins rather than just hailing from one particular area/lineage within Africa. A reflection of the multi-generational blending of various ethnic groups from Western & Central Africa and to a very minor degree also Southeast Africa. Even if compared with other parts of the Afro-Diaspora this regional mix might be less heterogenous and more restricted to the Lower Guinea area. It’s fascinating to contrast the AncestryDNA averages i calculated with the estimated regional origins of Jamaicans according to historical, linguistic and mtDNA research. Obviously the regions are not measured in exactly the same way by each separate type of research but still a rough comparison might be insightful. I will just comment on the most outstanding differences & similarities i’m seeing. Otherwise please refer to the blogposts mentioned with each chart posted above. 1.The percentage of “Mandingo” runaway slaves (12,6%) seems a bit inflated to the otherwise minor reported presence from Senegambia according to AncestryDNA (“Senegal” = 2,7%), slave trade (2,1%) and mtDNA research (4,9%). 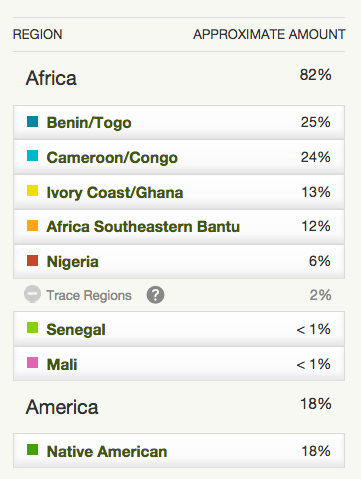 AncestryDNA does report higher “Mali” percentages for Jamaicans but this region is also more ambigiously defined. 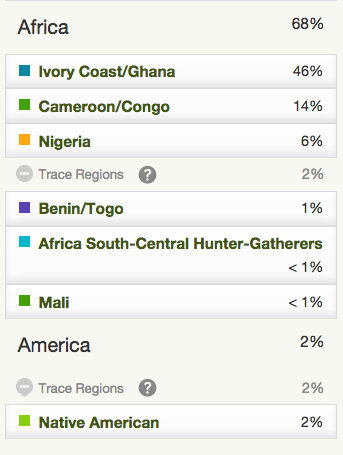 It might actually be more correlated with the 9.6% affinity for Sierra Leonean mt-DNA. Many of the socalled “Mandingo” runaway slaves might probably also have hailed from Sierra Leone or Guinea Conakry rather than Senegal or Gambia, something which might be obscured by using the term “Greater Senegambia”. Senegambian roots in the strictest sense of the word appear to be among the lowest in the Americas for Jamaicans. 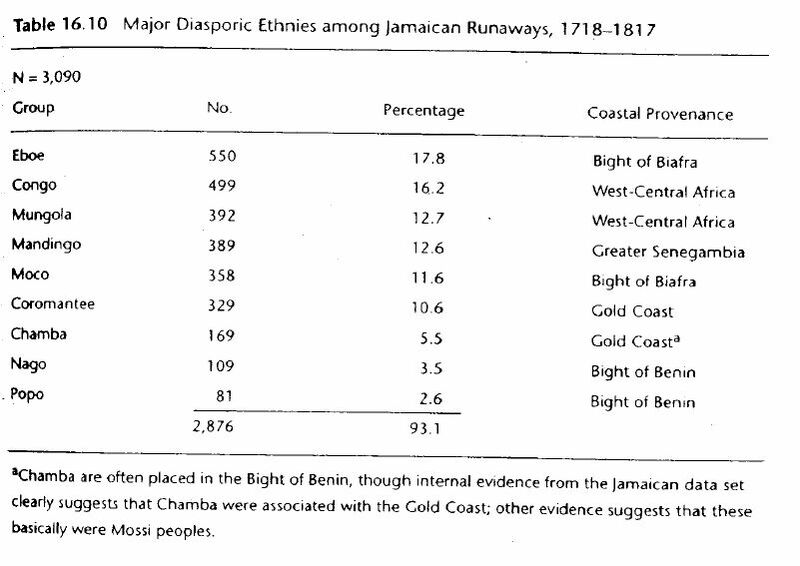 2.The combined percentage of Gold Coast Runaway slaves (“Coromantee” + “Chamba” =16.1%) seems to understate the large genetic impact from Ghana according to both AncestryDNA & mtDNA research and also implied by slave trade statistics and linguistics. The sample of runaway slaves is heavily drawn from a later timeperiod (1775-1817) which might explain this difference. The greatest wave of Gold Coast captives arriving in Jamaica in the mid-1700’s. By the time of 1775-1817 many locally born or socalled “Creole” slaves might have had more pronounced Ghanaian origins than reported for the Runaway Slaves. 3. 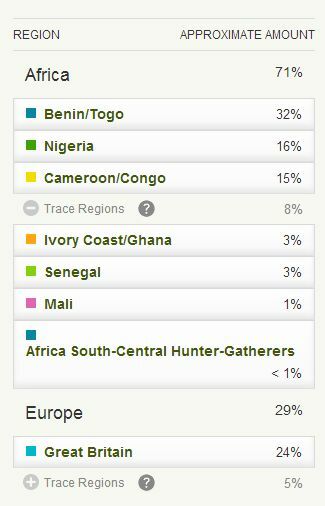 On first sight the “Benin/Togo” scores on AncestryDNA seem to be more prominent than according to other sources. Especially when comparing with the socalled “Popo” runaway slaves (an umbrella term for mostly Gbe speaking people) who were a mere 2,6% of the sample. The runaway advertisements were however biased towards later timeperiods, while most Bight of Benin slave trade for Jamaica occurred in the late 1600’s and early 1700’s. As also discussed on this page, aside from pinpointing genuine Beninese/Togolese origins the socalled ‘Benin/Togo” region could very well and perhaps even more frequently be referring to other types of ethnic origins found mainly among non-Akan groups in Ghana and specifically (but not exclusively!) the Ewe. And in addition perhaps to a lesser degree also by way of Nigeria, as both Igbo and Yoruba carry “Benin/Togo” markers. 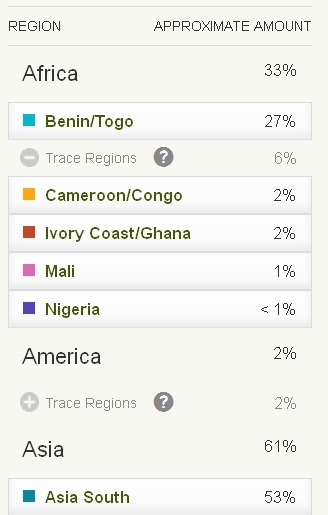 But even if “Benin/Togo” shows overlap with “Ghana/Ivory Coast” and the country name labeling shouldn’t be taken too literally there must be something distinct in their ancestral makeup that’s causing so many Jamaicans in my (limited) sample to have “Benin/Togo” as number 1 main region, rivalling the number 1 spots for “Ghana/Ivory Coast”. Also on average the “Benin/Togo” scores for Jamaicans are among the highest in the Afro-Diaspora safe for the Haitians as expected. In that light it’s revealing perhaps that most recent linguistic research (Farquharson, 2012) has been uncovering significant non-Akan influences coming from Ghana as showcased by the percentages of Gbe, Guang and Ga in the 4th screenshot above. Also in the mtDNA research a main finding was that the Bight of Benin seemed more important than the Bight of Biafra and Central Africa as a matching region for Jamaican maternal haplogroups. I suppose this makes the seemingly overprominent “Benin/Togo” results for Jamaicans seem more valid as they are no longer unexpectedly predominant but still significant in an explainable manner. 4. There seems to be a striking disagreement about the possible Nigerian ancestral contribution for Jamaicans. According to both mtDNA and linguistic research the Bight of Biafra or Igbo influence was found to be not even secondary but just minor compared with the one from Ghana. However the AncestryDNA results sofar seem to favour a prominent autosomal, genetic impact of Nigerians. That is genomewide and not just restricted to maternal lineages. It’s certainly significant when judging by the high average sofar for “Nigeria”, percentagewise also convincingly higher than in other parts of the Afro-Diaspora. However going by the current median score and also the frequency of number 1 scores it’s still the “Ghana/Ivory Coast” region which seems more significant, only if just slightly. Also aside from having the highest average “Nigeria” proportion among selected parts of the Afro-Diaspora also “Ghana/Ivory Coast” is peaking for Jamaicans (see first chart above). It will be very fascinating to see what will be reported when larger Jamaican samplegroups are available. An almost equal contribution might be expected based on the Trans Atlantic slave trade statistics. However according to some scholars the Inter-Colonial slave trade, re-eexporting slaves from Jamaica to other colonies, might have been ethnically selective and disproportionally targetting Igbo captives. The data from the Runaway Slave advertisements provide an interesting twist to this debate, as in fact the Igbo slaves were the most numerously mentioned in that sample. Also the socalled “Moco” runaway slaves highlight the significant presence of non-Igbo captives being taken from the Bight of Biafra, most likely from areas closer to the border with Cameroon or even partially from Cameroon itself. 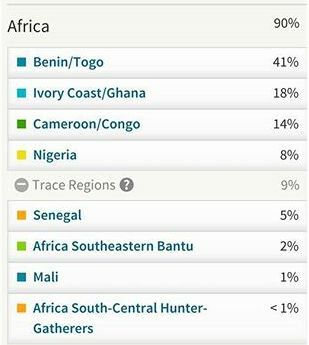 It might very well be that many of their inherited DNA markers are being read as “Cameroon/Congo” rather than “Nigeria” by AncestryDNA. 5.The Central African legacy for Jamaicans is being reported rather consistently as substantial but clearly secondary to Lower Guinean roots. Only the Runaway Slave data seems to be showing a disproportionally high amount of Central African origins (interestingly also specified in both “Congo’s” and “Mungola”). However again this is caused by the timeperiod bias of the advertisements. As also seen in the West Indian Slave Registers, Central Africa and the Bight of Biafra predominated in British slave trade in the very last decades before Abolition. Given the trivial amount of documented slave importations from Southeast Africa into Jamaica (0,1%!) it seems fair to assume that the “Southeast African” category from the mtDNA research and also the “Southeastern Bantu” AncestryDNA region are actually referring to (West-)Central African origins from mostly the Congo (DRC and Brazzaville), Gabon and northern Angola. Combining things for the maternal haplogroup findings we then get an estimated proportion of about 18% (8.9% + 9,2%), which is very close to the linguistical outcome of 19% and slave trade data of 16,1%. It becomes a little bit more tricky when we contrast this with the AncestryDNA data. The socalled “Cameroon/Congo” region is afterall measuring genetic similarity to samplegroups with both Central African (Congolese) ancestry as well as Biafran origins from Cameroon. As can be seen from the Nigerian averages in fact these DNA markers are also to be found in the wider Bight of Biafra hinterland further to the west. A good part of the Jamaican “Cameroon/Congo” scores might therefore be coming from eastern Nigeria rather than reflecting Central African ancestry. When making a very conservative estimate we could deduct 5% from the current 20,1% average for “Cameroon/Congo” ending up with about 15% “genuinely” Central African affinity, combining this with the much smaller scores for the “Southeast Bantu” and “Pygmy/San” (“SC Hunter Gatherers”) regions we arrive at a very rough proxy of about 17,5% Central African ancestry, in line with the above findings. 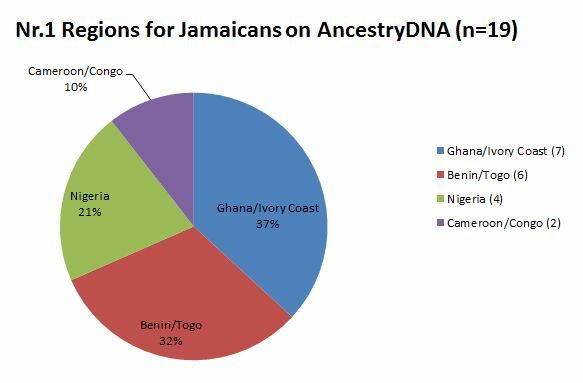 Summing things up we could say that the assumed predominance of origins from Ghana and Nigeria according to history, linguistics and mtDNA is largely confirmed by the Jamaican AncestryDNA results sofar. But interestingly it is also qualified and given more detail (even when applying somewhat confusing countryname labeling) by the eyecatching results for especially “Benin/Togo” and to a lesser degree “Cameroon/Congo”. As far as i know and was able to verify all of these screenshots below are from persons with 4 Anglo-Caribbean-born grandparents from the same indicated nationality. Meant to illustrate the individual variation among West Indians in the first place. Despite the limited samplesize these results might still also be quite representative while a few of them could even show distinct patterns for their nationality. I like to thank again all the persons who kindly agreed to share their results with me! For more information on what type of ethnic origins could possibly be implied by these regional breakdowns, see also this overview of charts based on West Indian slave registers etc. 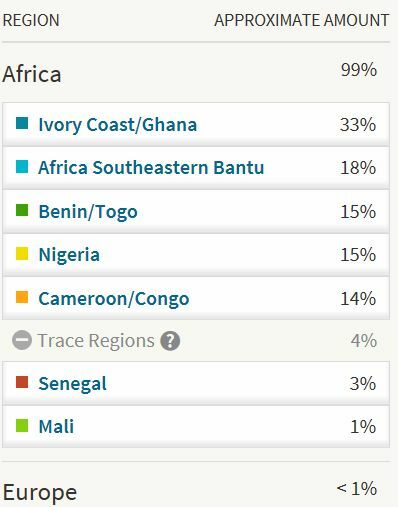 Especially the first 3 results are showing an impressive & predominant (>50%) proportion of most likely Ghanaian ancestry. Even when also Liberian ancestry could be picked up by this region (see African results). The combined top 2 score of the first result is also very high, it’s about 90% of his total African ancestry (87/94), while for Jamaicans on average this combined top 2 score would be nearly 70% and for African Americans and Haitians about 60% (see this chart). Indicating his African origins are much less regionally mixed than what’s average for Afro-Diasporeans. Something which seems to typify other Jamaican results as well even when not to this exceptionally high degree. This second screenshot looks very similar to the one above with the exact same amount of 53% “Ivory Coast/Ghana”. One difference being that “Nigeria” is combined with “Cameroon/Congo” this time. However actually all of it could still be from the wider Bight of Biafra hinterland, as also Igbo’s show substantial “Cameroon/Congo” in their breakdown. 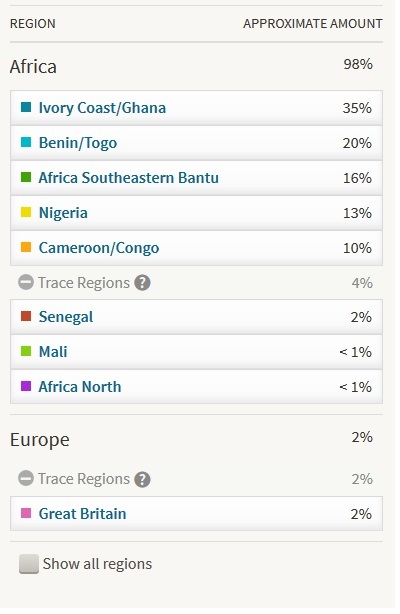 This nearly 100% African breakdown is showing a combination of “Ivory Coast/Ghana” with “Benin/Togo” instead. In spite of the labeling i suppose (non-Akan) Ghanaian origins could also be captured (in part) by that latter region, which would increase the overall predominance of most likely Ghanaian roots for this person. The trace regions seem to be very typical of the least significant regions for Jamaicans. Even when for individuals there might still be variation. Two results with “Ivory Coast/Ghana” amounts in between 40-50%. which is still very impressive. Also interesting how the minor South Asian admixture is more significant than any trace amounts of European origins for both. The 5% “Asia South” seen below is most likely corrsponding with the expected genetic inheritance of one single greatgreat grandparent from India (6,25%). My Family Is West Indian. How Did I Get Melanesian DNA? 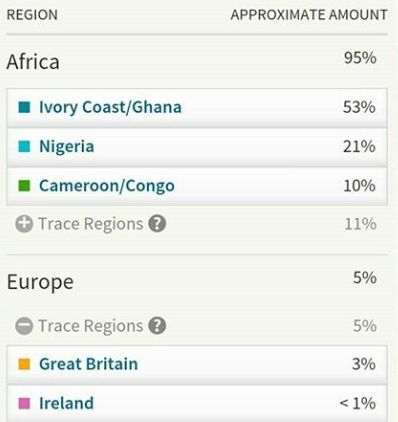 Aside from prominent “Ivory Coast/Ghana” scores also “Nigeria” is usually showing up with rather high percentages as well in the remaing screenshots below. Two of the results also showing a noteworthy 100% African score. These results below also show “Ivory Coast/Ghana” firmly as number 1 region but otherwise it’s a very balanced and diverse breakdown. The 18% “Southeastern Bantu” seems to be remarkably high for Jamaican standards (as observed sofar it’s the highest score). It might very well be connected to either Angolan or interior Congolese origins. This result shows a lower total African amount but still the “Ivory Coast/Ghana” contribution is subtantial (23/53=43% of the African breakdown). Interestingly also the combined top 2 with “Cameroon/Congo” is very predominant (44/53=83%). The first result seems to show an uniquely preserved lineage from just one African region, labeled “Benin/Togo” by Ancestry.com. It’s 78% (32/41) out of his total African ancestry. One of the highest regional ratio’s i’ve seen. Perhaps also to do with a relatively higher level of non-African ancestry and recombination but still very impressive. For possible interpretations of this region see discussion above as well as this page. An extraordinary amount of “Benin/Togo” being shown below. The highest i have seen not only for Jamaicans but also among Haitians! Illustrating the regional overlap across the Diaspora. However the actual ethnic origins which gave rise to this score may very well be different. All things being the same the chances of the average Haitian having ancestral connections to a genuine Beninese ethnic group (or groups) are probably greater than for the average Jamaican. Ancestral ties with non-Akan speaking Ghanaians and southern Nigerian connections being more likely for Jamaicans. However in individual cases all scenario’s might apply. This Jamaican’s breakdown could very well have been the breakdown of an African American person. It shows the four main regions showing up most frequently for both African Americans and Jamaicans. With a slight edge for “Nigeria” as is often also the case for Americans. 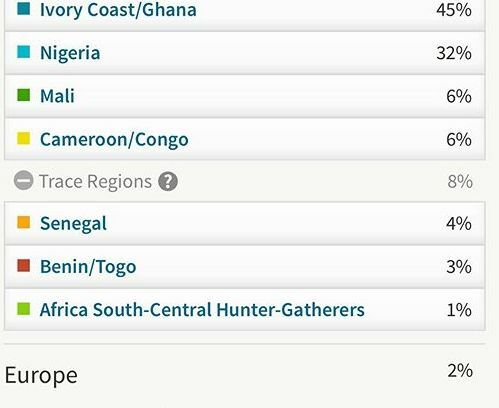 Also the total amount of African is very similar to the African American average i observed for 350 persons (see African American AncestryDNA results). Obviously the minor European share consisting mostly of Great Britain is in line as well. It goes to show the great degree of genetic similarity between Anglo Caribbeans and African Americans. From what i’ve seen sofar and allowance being made for individual variation, i would say distinctive African American breakdowns often feature a higher amount of either “Senegal”, Southeastern Bantu” or “Mali” when compared with West Indian results. Especially for people with higher than average amounts of African ancestry. Also minor Amerindian %’s will be more likely to occur among African Americans (even when usually <2%) while being almost always absent among Anglo-Caribbeans (when restricted to islanders and excl. Trinidad & St.Vincent). Distinctive Jamaican results i have seen sofar are the ones who feature one single predominant African region (>50%), highlighting their more regionally concentrated African origins. But besides these more “distinctive” (but not per se most frequently seen) results there will be many overlapping results such as this one. As an interesting sidenote this person also tested his maternal haplogroup with AfricanAncestry and was found to match Tikar samples from Cameroon. The Tikar have also been reported as haplogroup matches for many African Americans taking the same test. “Nigeria” and “Cameroon/Congo” are shown as having the same share, however it could very well be that a part of the “Cameroon/Congo” markers were actually inherited from Igbo or otherwise southeastern Nigerian ancestors. Also a substantial proportion of “Mali” in this breakdown. The person below shows a high relative contribution of “Nigeria”: 55% (25/45) of his African breakdown. Possibly also because the total amount of Africn ancestry is relatively low when compared with the average amount for Jamaicans. But still impressive. Also the amount of “Ivory Coast/Ghana” is noticeable. A more regionally balanced breakdown shown below, even when “Nigeria” and Ivory Coast/Ghana” still predominate. Also notice the 13% South Asian which corresponds very well with the expected genetic contribution of 1 greatgrandparent from India (12,5%). 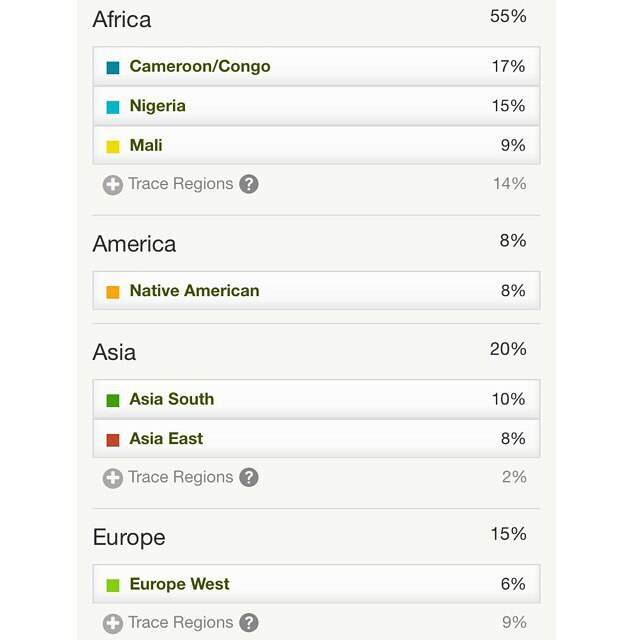 Considerable “Nigerian” score given the relatively lower total African amount. Also interesting how these results show 2% Native American. Sofar (n=51) i have not seen similar scores for other Jamaicans who almost always show zero% or at most <1%. Based on that finding it seems that almost all local Arawak bloodlines have been diluted to near genetic extinction. However not so for this person whose parents are both fully Jamaican. Naturally i do not have confirmation about her greatparents or beyond. But the European breakdown, heavily dominated by Great Britain, seems to rule out any recent Hispanic family line which might have introduced the 2% Native American. Instead it might still be indigenous to Jamaica, even when strictly speaking not only Arawak but also other types of Amerindian might be hinted at. It is documented not only for Jamaica but also other West Indian islands that Native American captives were brought over from the mainland, both North and Central America, mostly during the late 1600’s and early 1700’s. And even at times Amerindian mixed people might have volutarily settled in Jamaica during the colonial era, specifically the Miskito. Even when relatively speaking Jamaicans might have a lower amount of Central African ancestry than other parts of the Afro-Diaspora, these results below prove that this is not always the case. “Cameroon/Congo” is clearly the biggest region being shown and makes up almost half of the African breakdown (42/95) for the first result. Technically speaking also Bight of Biafra connections might be suggested but given the minimal amount of “Nigeria” this seems less likely. It’s interesting to note that i have seen both Haitian and African Americans with quite similar results. Both in regards to their total African amount being >90%, and their “Cameroon/Congo” being >40%. In fact even the remaining parts of their composition were not really distinct for any nationality, showing the great deal of shared regional origins within Africa across the Diaspora, at times also proportionally speaking. The trace amounts of “Senegal” and “Southeastern Bantu” and absence of any Native American do make this result appear typically Jamaican, but again not uniquely so. Another result with a very pronounced “Cameroon/Congo” score. Even moreso because this person is of 100% African descent! Sofar i have seen 6 Jamaicans who scored 100% African (see this link for the most recent overview). Interestingly three of them had “Cameroon/Congo” as number 1 region. Now obviously these observations are still very limited in number. However it might suggest that for these persons especially their Central African origins are relatively recent. Possibly also to be connected with Congolese contract labourers who arrived on Jamaica in the mid 1800’s after slavery had been abolished. A very exceptional score is obtained for the person below. 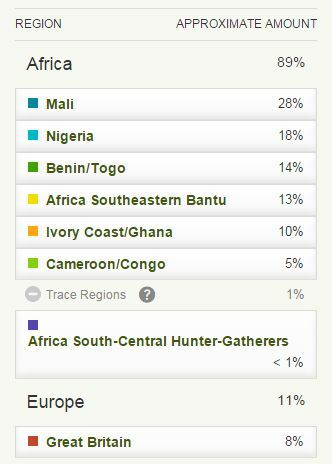 Even with a rather low total amount of African ancestry the “Mali” percentage of 42% is the highest i have seen among literally hundreds of AncestryDNA results for Afro-Descendants as well as dozens of AncestryDNA results for Africans! Such a predominance for a single region (42/52=80% of total African), is also very rare from what i’ve observed sofar. 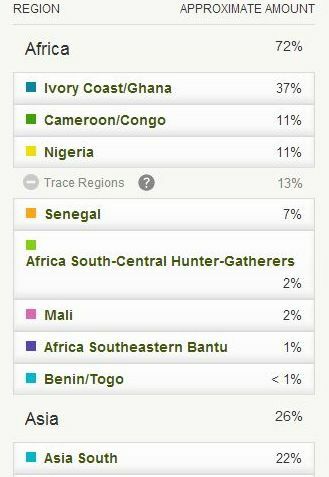 Ironically even for the socalled “typical native”, the 16 Malian samples used by AncestryDNA, only an average of 39% “Mali” was found! (see also AncestryDNA regions). As mentioned earlier the socalled “Mali” region is not restricted to pinpointing origins from within Mali’s borders; also neighbouring countries could be involved, incl. Burkina Faso. It will be very fascinating to see where this person’s African DNA cousins might be hailing from. Showcasing a diversity of main regions but mostly Lower Guinean ones just like Jamaicans. A signature feature of their breakdown also being a noticeable percentage of Amerindian origins. Especially for the first set of results who are Garifuna, while all the other ones are Belizean Kriol, many of them however with partial Garifuna lineage. 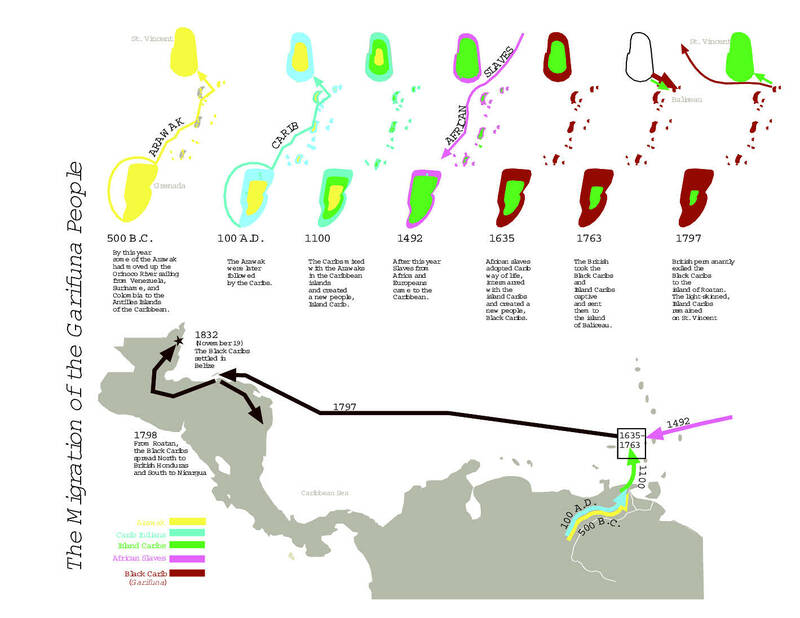 Migration of the Garifuna in the Caribbean. In line with the previous Garifuna results when it comes to the regional distribution of her African ancestral components. However the appearance of a significant amount of European ancestry already indicates she’s not fully Garifuna. Notice how in the previous Garifuna results European admixture was (nearly) absent. While Native American was obviously reported at significant levels (13-18%). This person in fact has one grandfather who is of fully West European descent. Very interesting therefore how AncestryDNA is correctly estimating her European side to be about 1 quarter (27%). In addition she also shows a Native American (Carib) contribution of 13%. 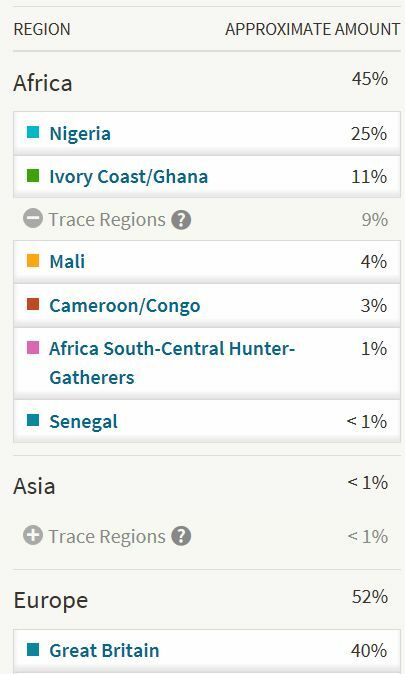 This first Kriol result shows one of the highest “Ghana/Ivory Coast” ratio’s i have observed, it’s about 67% (46/68) out of his total African ancestry. For more information on what type of ethnic origins could possibly be implied by these regional breakdowns, see also “Guyanese Slave Census of 1819 , less specified but still representative?” . 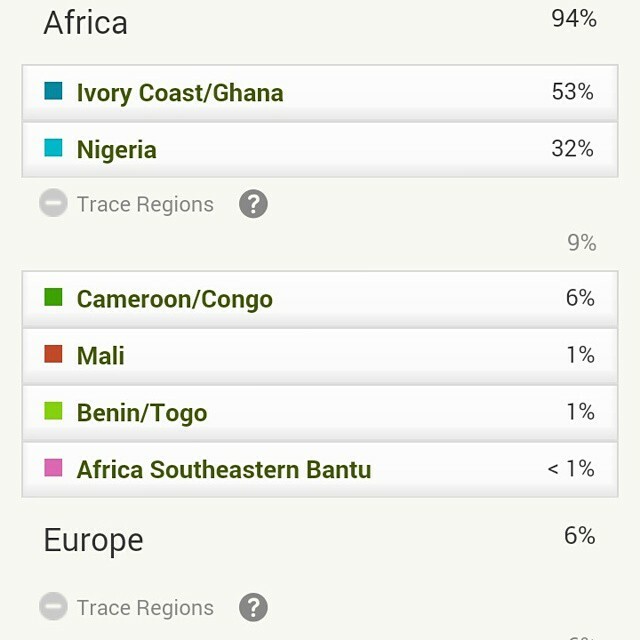 The first result showing a highly concentrated regional breakdown for the top 2, almost 80% (77/97) out of his total African ancestry. With “Ivory Coast/Ghana” firmly in the top spot just like most of the results shown below. A truly sensational result shown below. It features by far the highest amount for one single African region i have observed. Perhaps not surprising it should be “Ivory Coast/Ghana’, eventhough i imagine there might also be Guyanese who will score exceptionally high for “Cameroon/Congo”. 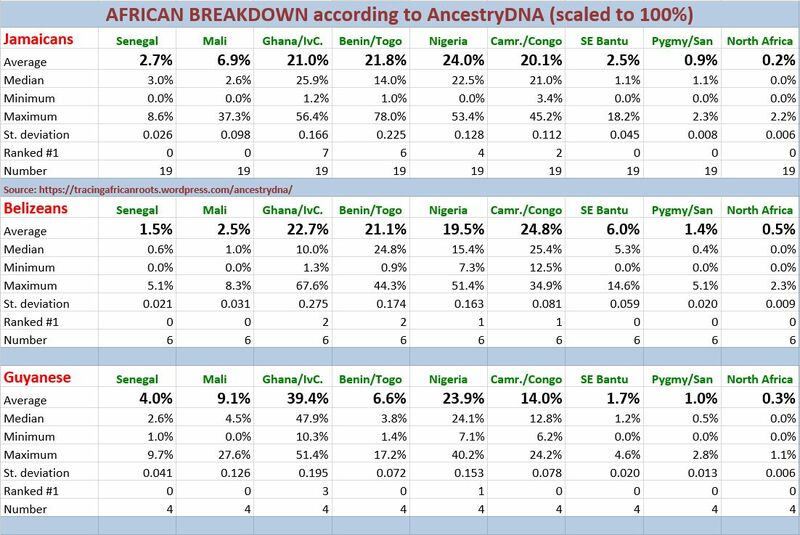 In my survey of AncestryDNA results across the Afro-Diaspora i found that it’s very uncommon for Afro-descendants to score an African amount of >50% for just one region (11/707=1,5%). This person not only accomplishes that rare feat but at the same also is of 100% African descent! Tracing back to Africa might be more easy therefore. Quite likely because of relatively recent lineage from Africa which meant less generational blending into the Guyanese melting pot. Guyana received socalled African contract labourers (really liberated captives) up till the mid 1800’s. Many of them by way of Sierra Leone.In fact eventhough the odds are very high that this person in fact is of predominant Ghanaian or Ivorian descent, there could still also (in part) be Liberian or even Sierra Leonean origins included in the 75% socalled “Ivory Coast/Ghana”. Aside from the impressive “Ivory Coast/Ghana” score also a very noticeable “Southeastern Bantu” percentage. A rather balanced breakdown, still featuring “Ivory Coast/Ghana” in first place. But also the combined Upper Guinean score (“Senegal”+ “Mali”) is significant. A little bit over a half of this person’s African origins are from the “Ivory Coast/Ghana” region. Most likely indicative of Kromanti roots, eventhough other options still also remain possible (Liberia). Yet again a relatively high “Ivory Coast/Ghana” score in the result below. It’s exactly half of the African breakdown (13/26). “Ivory Coast/Ghana” is still showing up strongly in the result below but no longer in first place. As surely a bigger sample size will demonstrate Guyanese also receive other top ranking regions in their AncestryDNA results. In this case it is “Cameroon/Congo”. And in fact especially Congolese presence has been extensively documented in Guyana. 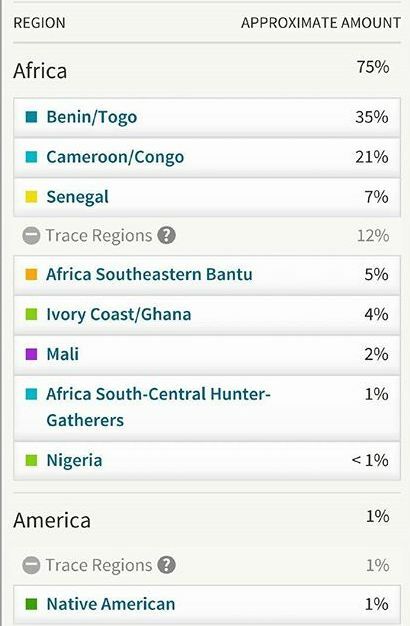 Aside from the high “Nigeria” also a very noticeable “Mali’ score.This is what the person tested had to say herself. Interesting remarks. “my Ancestry.com DNA results surprised me in part. I know Guyana had a large West African population during the 17th-19th centuries and our culture is infused with Nigerian and Ghanaian traditions, but I never heard about Malian culture being integrated” (Read more via this link). For more information on what type of ethnic origins could possibly be implied by these regional breakdowns, see also “Trinidad’s Slave Census of 1813 – Representative of African Ethnic Origins?”. An exceptionally high preservation of just 1 specific African regional lineage seems to be shown in the first result. 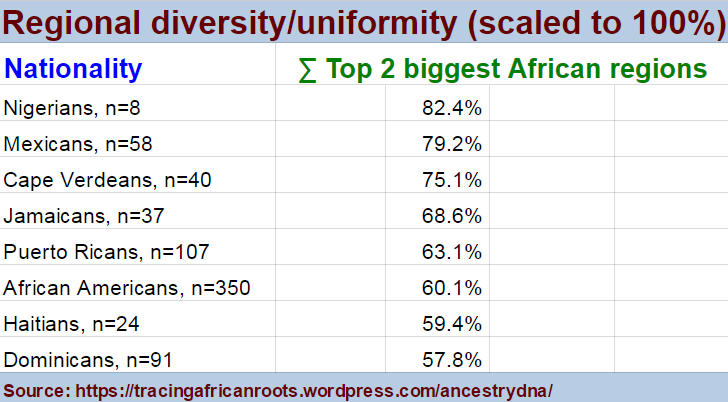 As a ratio to total African ancestry it’s above 80% (27/33), something which sometimes doesn’t even occur for AncestryDNA tested Africans themselves! Could somehow be caused by his relatively lower African ancestry or also recombination. Given a confirmed French Caribbean connection in this person’s family tree (as may be the case for many other Trinidadians as well, see blogpost above) the possibility of this “Benin/Togo” score pinpointing origins from within Benin’s borders might be greater than for people who are of strictly Anglo-Caribbean origins because of different French slave trade patterns with a higher continued focus on the Bight of Benin. 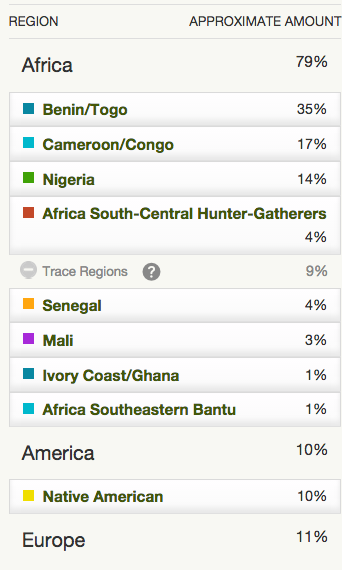 A more balanced African breakdown for this person who also otherwise shows a very blended ancestral composition, incl. South Asian, a typical combination for many Trinidadians. But in fact also Amerindian, East Asian and European origins are present in addition. 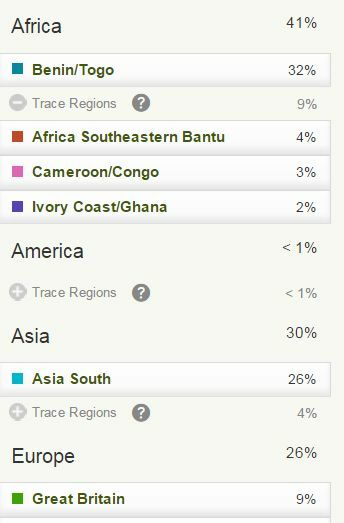 This result below shows a higher degree of total African ancestry than the previous ones. The high score of “Benin/Togo” is again striking. Also it seems her African roots are largely confined to the socalled Lower Guinea area, as the percentages for “Senegal”, “Mali” and “Southeastern Bantu” are minimal and only appearing as Trace regions. These results belong to a person who’s mostly (75%) Trinidadian but also partially of Grenadian descent. The top 2 combination of “Benin/Togo” plus “Ivory Coast/Ghana” is clearly predominant (45/69). Also noteworthy that despite having a significant degree of non-African ancestry, practically none of it is European. Because of their geographical location, nearby Florida and South Carolina, the Bahamas might have received a somewhat different proportional mix of African captives than the other English speaking West Indies. Judging from the Slave Voyages Database (see also this screenshot) this could indeed be true even if intercolonial voyages are not included. Still the breakdown shown below seems fairly standard also for other parts of the West Indies, highlighting the inevitable overlap between individuals. We will need more Bahamain results to establish any distinctive patterns. Quite representative of the 4 main regional lineages for Barbadians as well as most other Anglo-Caribbeans. With significant additional “Southeastern Bantu”. Interestingly no African Trace Regions being reported. Possibly even more representative results given Barbados’s documented African origins. In fact the most outstanding aspect of this breakdown is rather the 4% Native American. This seems like a highly atypical outcome for Barbados and also most other parts of the Anglo-Caribbean. From what i have observed sofar Amerindian origins usually not being reported at all or just barely so (<1%). Not that surprising given the lamentable fate of the native populations throughout most of the West Indies. However this individual case seems to testify otherwise. Quite likely it’s more reflective of a unique family lineage rather than something that’s widely dispersed. Balanced breakdown on the African side. Especially the top 3 is very evenly divided. Also noticeable how the minor 5% European is identified as strictly “Great Britain”. From what i have seen sofar such predominant British scores occur more frequently for Anglo-Caribbeans than African-Americans who often also tend to receive other North/West European regions in addition to just “Great Britain” or “Ireland”. Although also for them probably these last two regions are obtained most frequently on their European side. An impressive 50+% share for the “Ivory Coast/Ghana” region.Such a predominant score for just one single African region is quite exceptional. In my survey of 707 AncestryDNA results across the Afro-Diaspora i only observed this for 11 persons! Four of those persons being Jamaicans, for whom this type of breakdown seems more common. Appropriately this person is herself of half Jamaican descent. Actually her Jamaican father’s result can be seen in the beginning of this section. He scored 100% African and 33% “Ivory Coast/Ghana”. Still her heavy pull towards most likely Ghanaian origins might just as well be a genetic inheritance by way of her Barbadian mother. Afterall also Bajans are known to have a strong Ghanaian heritage. 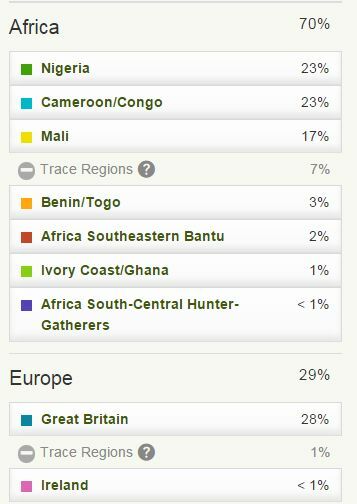 Again an impressive “Benin/Togo” score even more so because this person is virtually of 100% African background. Because Dominica has a history involving French rule and also French slave importations again the chances of “genuine” origins from Benin might be deemed higher than for persons of a strictly Anglo-Caribbean background (with no significant history of other European settlers). See also this previous blogpost: St. Lucia Slave Census of 1815 , reflecting English or French Slave Trade Patterns? However there’s no way to know for sure right now. It could be that this 50% is covering several family lineages all at the same time. 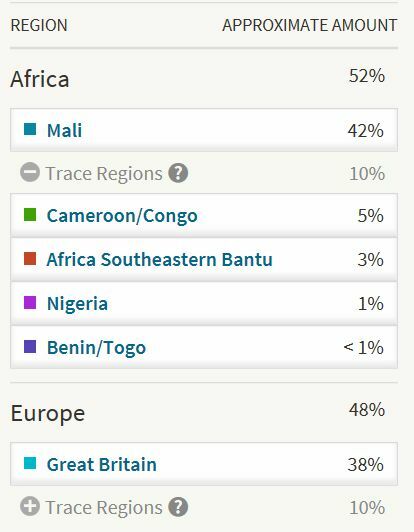 Afterall it’s not one of this person’s parents who’s from Benin/Togo but rather the 50% score should be reflective of a greater number of ancestors, mostly from the 1700’s who all carried these “Benin/Togo” markers in their DNA. 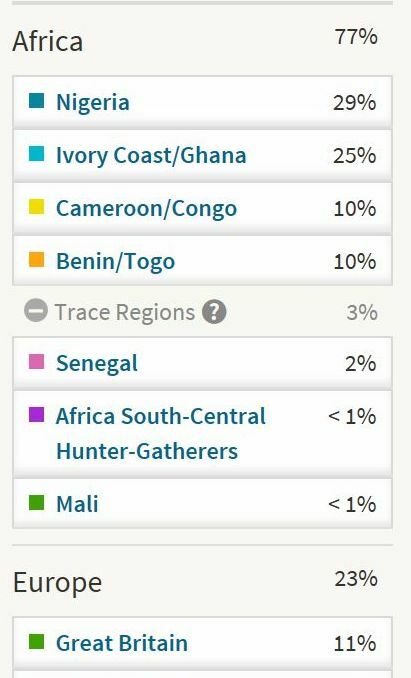 It could very well be that the majority of these ancestors would have ethnic background from within Benin (for example the Fon but maybe also Aja or other Gbe speakers) but perhaps in addition also there’s some minor Yoruba (they also score “Benin/Togo” %’s when doing the AncestryDNA test) and maybe even there’s some minor Ghanaian (from a non-Akan speaking ethnic group like the Ewe) all included in the 50% “Benin/Togo”. Quite diverse but evenly balanced results, also with notable “Southeastern Bantu”. Very interestingly this person also has been matched on 23andme with no less than 3 DNA cousins from Africa! They are from: Sierra Leone (Krio/Mende), Liberia (Grebo, Kru and Americo-Liberian) and Benin (Fon/Egun). It’s a bit tricky to place the Sierra Leonean and Liberian matches in this regional breakdown as they are themselves likely to be regionally mixed. 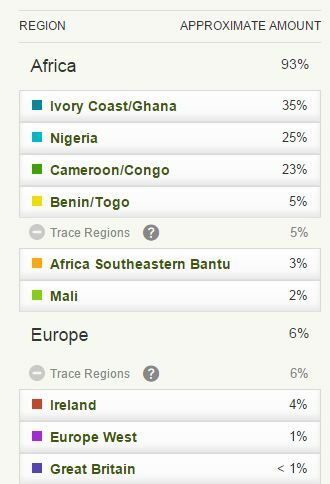 However i’ve seen one Liberian take the AncestryDNA test and he scored mostly (81%) “Ivory Coast/Ghana” (see “African results“). The match from Benin however definitely adds an extra underlining and confirmation for the 20% “Benin/Togo” score! 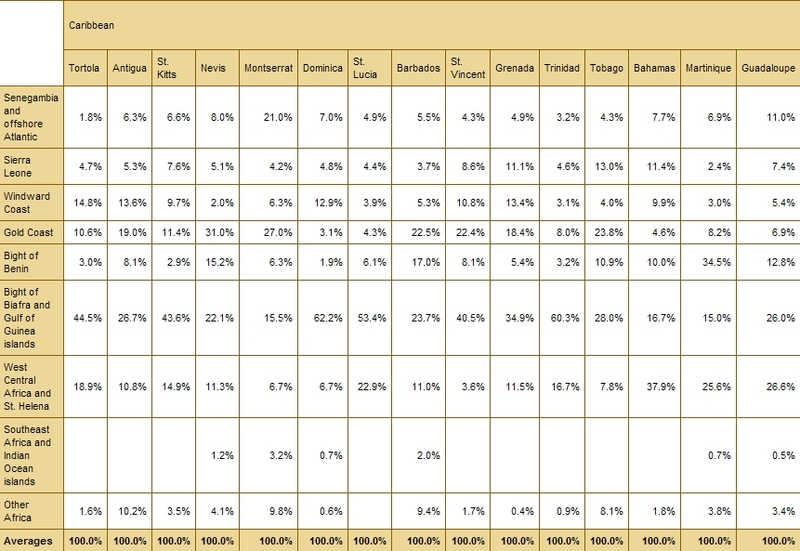 Again a diverse breakdown including no less than 6 Main Regions and leaving only 1% for Trace Regions. 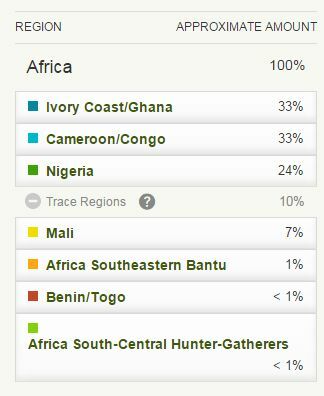 Interestingly “Mali” is showing up as number 1 region, probably atypical but showcasing that in individual cases Upper Guinean ancestry might be less diluted than it seems to be on average. This socalled “Mali” region is however not easily interpreted. It could be pinpointing origins from within Mali’s borders, but that country is said to be one of the most admixed among the 9 African AncestryDNA regions. Also in the Anglo-Caribbean Slave registers there are relatively few references being made to distinctly Malian ethnic groups, specifically the “Bambara”. Other ancestral options could therefore possibly be: Guinea Conakry, Sierra Leone and even the Gur-speaking northern parts of Ghana/Togo/Benin and Burkina Faso itself. Why is the piechart saying a different result from the spreadsheet four Jamaica? 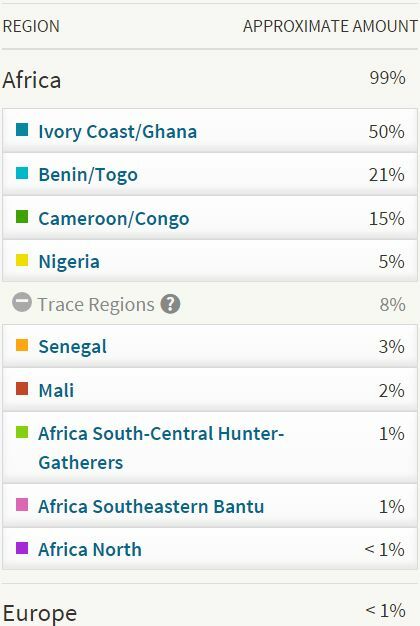 The piechart says there is more Ghana/Ivory Coast(Akan)DNA but the spreadsheet says there is more Nigerian (Igbo)DNKA. The piechart is showing the number of times a particular region was ranked as number 1 main region. The spreadsheet is more complete in that it shows the averages of all regions in the breakdown no matter how they were ranked. Keep in mind it’s all just a snapshot of the results i had available at the time i made this post. I’m still entering new results into the sheet so as the samplesize increases there might be some changes. Going by the data sofar it seems that “Ghana/Ivory Coast” is more likely to make the number 1 spot than “Nigeria”. But again the samplesize is rather small still. oh, here’s a video of a Jamaican/Puerto Rican, seeing as I noticed you used a half Bajan then you shouldn’t mind this contribution. Check out his DNA results he did it with ancestry.com. 61.3% of his DNA is Ivory Coast/Ghana, judging from Jamaican history and the results I’m going to say this side might be from his Jamaican side. The bantu DNA he gets is more than likely from his Puerto Rican side also judging from the lack of Bantu DNA for Jamaicans. 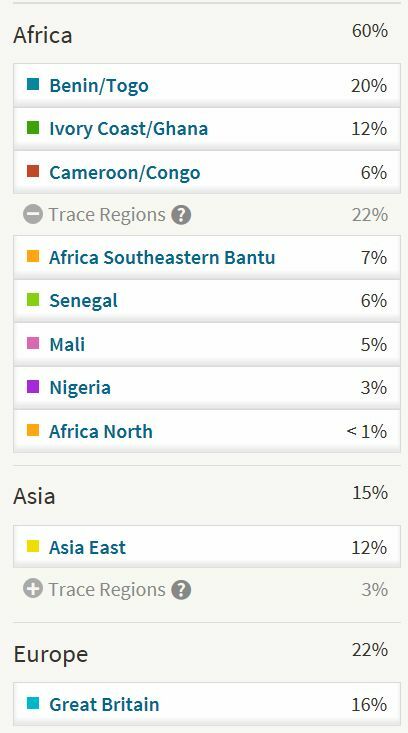 Jamaicans indeed show relatively little Bantu DNA on average however on an individual basis it will vary, see for example the results i posted for a Jamaican with 18% Southeastern Bantu (out of 99% total African). Also of course there’s the Kumina legacy of the Congo recaptives. Hey Howard, thanks a lot for sharing those great results! I have included your breakdown in my spreadsheet under “Howard” (let me know if you like me to change into some other nickname/acronym). The Mali score is also indeed above average however i have already seen quite a few Jamaicans who received similar amounts. The Ghana amount is still decent i would say. Especially when combined with the possibility that both the socalled “Benin/Togo” and actually also the socalled “Mali” regions might (in part) be inherited DNA by way of eastern Ghanaian ancestors (in particular Ewe) or northern Ghanaian ancestors (in particular Gur speaking groups). From what i’ve seen the socalled “Ivory Coast/Ghana” region is best equipped to pick up on Akan lineage from central and southern Ghana, but also in addition, Ivorian, Liberian and even Sierra Leonean ancestry might be described by AncestryDNA with this region. Hi, Thanks for sharing such wonderful information. I recently got back AncestryDNA test results for my father who is Trinidadian. His father was from Tobago and his mother from the San Fernando area. I was quite amazed that he had 100% African ancestry, given Trinidad’s diversity. His mix was 30% Benin/Togo, 23% Mali, 21% Nigeria, 18% Ivory Coast/Ghana, 4% Senegal, 2% Africa South-Central Hunter-Gatherers and 1% Africa North. I was wondering what your thoughts were on the breakdown. Thanks! Hello Sasha, thanks a lot for your message and also for sharing your father’s results. This is indeed the first Trinidadian breakdown i have seen with 100% African. But i suspect many others might still also score very high African amounts, perhaps even more so from Tobago. I would say your father still has quite diverse origins and also in fairly even proportions. It’s just that all his regions are spread across Western Africa. One notable aspect is that there seems to be no indication of any Central or Southern African ancestry (as measured by “Cameroon/Congo” and “Southeastern Bantu”) safe for the tiny amount of socalled South-Central Hunter-Gatherers. The socalled “Benin/Togo” could be genuinly suggesting ancestry from Benin and Togo but might as well include ancestors from southern Nigeria or eastern Ghana (Ewe). 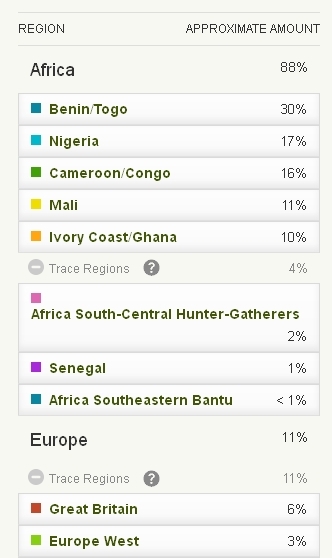 Out of his 1,184 DNA matches i was able to find 11 most likely native African profiles! Three of those matches would be Nigerian. 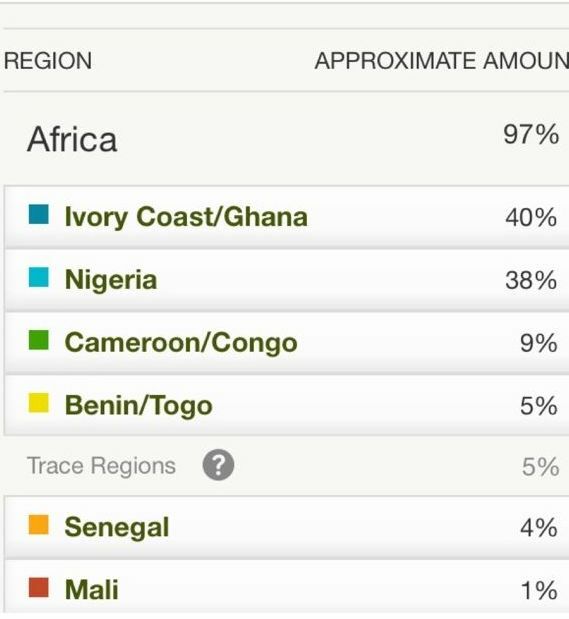 From Guinea Conakry and Ivory Coast i found one DNA match each. And from neighbouring Liberia no less than 4 certified matches! With an additional two profiles quite likely being Liberian and also one profile belonging to a half Liberian half African American person! These Liberian matches are quite astonishing not only because the pattern seems quite consistent (the matches from Guinea & Ivory Coast most likely being related) but also the shared DNA segments are rather big for most of these matches (and therefore more reliable!). This could be very helpful to zoom in closer into the possible ethnic lineage hiding behind his regional breakdown. In particular for regions such as “Ivory Coast/Ghana” and “Mali”. It should be kept in mind that DNA from especially Liberia but also Sierra Leone and Guinea Conakry will (in part) be described by the socalled “Ivory Coast/Ghana” region (due to a lack of samples). Therefore the country name labeling of AncestryDNA’s regions should not always be taken too literally! It is fascinating also that your father did not receive any Ghanaian matches yet, although this could always change of course when more Ghanaians get tested. Congratulations! Your breakdown looks very much in line with the 100 Jamaican results i have seen sofar. Very impressive Nigeria/Ghana combo. If you have a screenshot to share i would be much obliged! I would love to include it for an upcoming update of this page. What’s the highest Senegal that you’ve seen in African Americans? That’s one of the lowest regions I’ve seen on results, but I thought that it was supposed to be like the Mecca of slave trading for West Africa. It’s still “only” 25%, same as it was when i completed my African American survey in 2015 based on 350 AncestryDNA results (see this link). Even when i have literally seen hundreds of AA results since. See also this post for more details. My husband and I just got back our results. I'm so fascinated by how mixed I am. I feel like I can't pinpoint my ethnicity to one particular at all. Would love to hear your thoughts! Hi Candace thank you for sharing your results! Very fascinating indeed to see all the various regional scores. West Indians and in particular Belizeans are known for having very diverse populations. However for correct interpretation it’s essential to realize that most people (incl. those who selfidentify with just one ethnicity) will tend to get their DNA described as being a composite rather than being 100% this or that. This has to do with genetic overlap, ancient migrations and intermixing from sometimes many, many generations ago, beyond family recollection. So looking at your breakdown it’s possible that for example all your European regions will still trace back to only Great Britain, as all these regions are being reported for “native” Britons as well. Also the 1% socalled Central Asia is most likely just a misreading of your Native American heritage (due to very ancient shared origins from Siberia). The 4% socalled Central Asia for your husband is most likely to be combined with his 9% “Asia East”. Adding those two up gives you 13% which seems to imply he had a Chinese great grandparent (1/8= 12,5%) and his grandfather would have been half Chinese. Right now your husband is in row 232 and you are in 237. It might be useful to compare with other people. I am intending to do an update of my West Indian survey shortly and then i will be able to give more details. But right now your husband fits in perfectly within the variation i have observed for 100 Jamaican results. The diluted Asian admixture is quite common. His overall African percentage (81%) is practically the same as my group average. Also having “Ivory Coast/Ghana” as primary African region is quite typical. His African regional mix also looks very Jamaican. I have less Belizean results to compare with (7 Kriol or mixed Kriol and 7 Garifuna). So keep in mind that individual variation is always a given. Still what stands out to me right now is first of all your Native American percentage being above average. Do you perhaps also have Garifuna lineage? Your socalled “Southeastern Bantu” score is also relatively elevated and more in line (sofar) with the Garifuna group average. It might however be related to your “Cameroon/Congo” score as Central African DNA is often described as a combination of both these regions. The most striking African score to me would be the 12% socalled Mali. I have not yet seen any Belizean score such a high amount, especially given that you have 59% African in total. Also among West Indians it is usually subdued although some people do score high percentages for it. It can be suggestive of various types of ancestry, not per se confined to Mali but also the surrounding countries. The 3% socalled Caucasus is also intriguing. It is however still a low confidence region, so without any additional clues its quite possible it might just be a misreading. To get more insight i would advice you to have a detailed look into your DNA matches as they might provide you more chances of pinpointing specific ethnic groups among your various family lines. See also this tutorial and the previous comments on this page in regards to the results of Sasha from Trinidad. Thank you so much for the reply. I do not have any Garifuna lineage as far as I am aware. The Native American would represent my grand mother and great grand mother who were both Mayan Indian. I knew I had this mixture but I did not expect it to come so high. 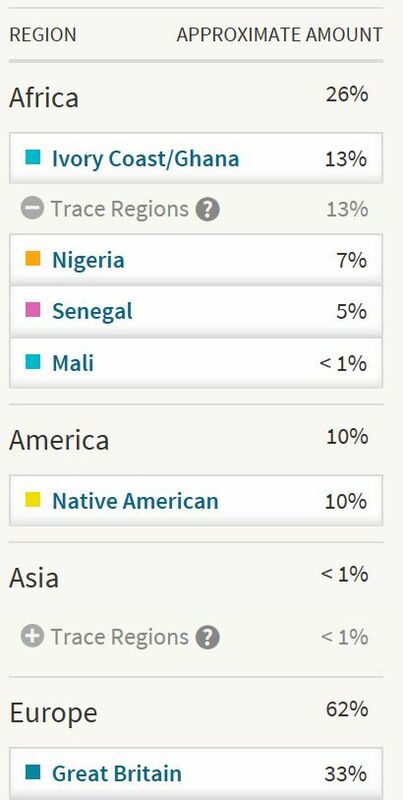 I will definitely go through the link you sent me on how to find elusive African DNA matches on Ancestry as my results, as you pointed out, are very unexpected. Your website is fascinating! …and so very timely. I just got my Ancestry DNA results and would like to share them with you. I am 100% Antiguan living in the USA for a long time. I was fortunate to know my GGranny who told me that we were Asante…she may be right! Then I have 150+ other regions! It's overwhelming but that 51% brings me great comfort 🙂 I'll be back to share my husband's results. 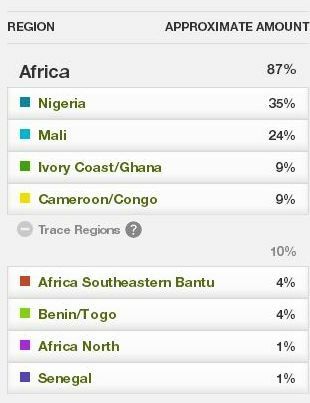 One of the main findings is that socalled “Ivory Coast/Ghana” can indeed be very predictive of Akan lineage from Ghana. But in addition it’s also very predictive of Liberian lineage. As most Liberians in my survey tend to receive “Ivory Coast/Ghana” scores higher than 80%. For people from the Diaspora of course one thing doesn’t rule out the other as both lineages can be combined in one person. Your own 51% “Ivory Coast/Ghana” is very impressive and one of the highest such scores i have observed for West Indians. Although still quite typical as for many West Indians this region comes out as the biggest one, in line with their known widespread Ghana connection. Very precious to actually have a family tradition by way of your GGranny telling you that you have Asante ancestors. I took the liberty to have a closer look into your DNA matches to see if anything more specific can be said. I first scanned all of them and then i filtered them for both 100% African as well as 100% European profiles (see this tutorial). Looking at your possibly African matches (going by plausible ethnic regions, family names and other profile details) i believe you have atleast 14 of them already! You will have to contact them to confirm their background. Possibly 5 appear to be from Nigeria, which is quite amazing given that you only have 2% “Nigeria” ! 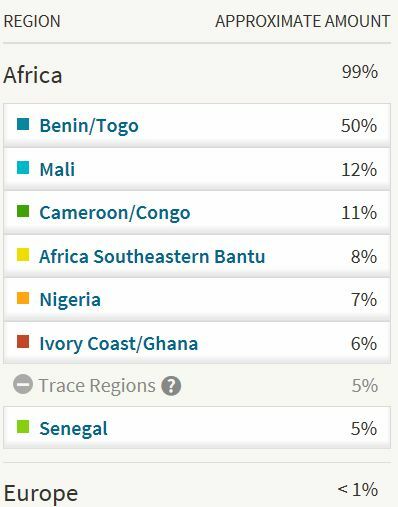 I suspect however that your 19% socalled “Benin/Togo” might actually also be inherited (in part) by Nigerian ancestors. I go into it in greater detail in that new blog post of mine. 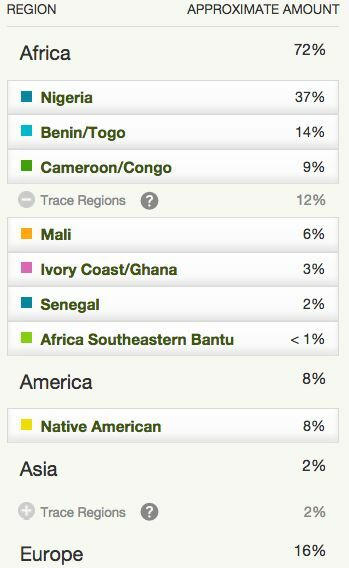 But “Benin/Togo” despite the labeling is quite commonly reported for southern Nigerians taking the AncestryDNA test. In fact one of your possibly Nigerian matches has this region in first place! You also seem to have 5 matches from Ghana, and atleast one of them would be of Asante descent! So this definitely confirms your 51% “Ivory Coast/Ghana’ score. But that’s not the end of the story 🙂 Intriguingly you also seem to have 4 Liberian matches! Suggesting that not only Ghanaian but also Liberian ancestors passed on that part of your DNA, labeled “Ivory Coast/Ghana’ by AncestryDNA. This outcome is a perfect illustration for the main theme of my West African survey findings! This is a common reaction. DNA testing can often be a bit overwhelming depending on your prior expectations. Especially how most Afro-Diasporans tend to have mixed origins across West & Central Africa. I would advise you to do some follow up research to make more sense of it. Plus keep in mind that your results might very well change in the near future as Ancestry might be implementing an update of their ethnicity *estimates*. Quite amazed and pleased to find this extensive resource on the Caribbean’s African roots. Best wishes from England, UK. Thanks a lot for your comment and the appreciation! I hope to eventually update this page with my expanded survey findings for especially Jamaicans but also other parts of the West Indies. That would be great. My parents are Jamaican but I was born in England, so I would definitely be interested. Having grown up around people from many different islands, I’d also love to see similar research on their histories. Hi,my Mother was from St.Kitts and my father from Barbados and these are my Ancestry DNA results. 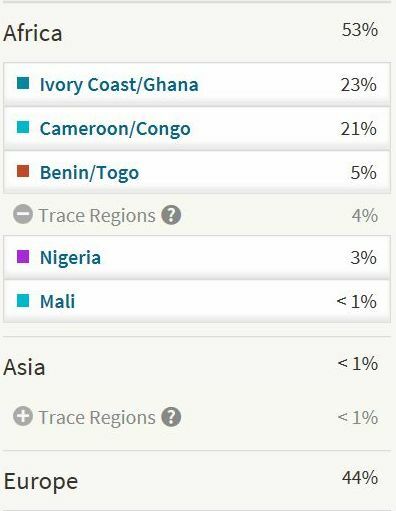 Based on your research as shown,why the difference between the Benin/Togo,Nigeria and Ivory coast/Ghana? Your results have been updated. As I have argued in my latest blog post, this update will NOT be an improvement in regards to the African breakdown. Instead regrettably it might lead to less insight into the African regional roots of Afro-descendants and actual Africans. In the last past years I did find that regionally speaking the previous version of AncestryDNA was reasonably in line with either historical plausibility or actual verifiable genealogy. Despite several shortcomings as well as the continued need for correct interpretation. However I fear that this will no longer be the case after the update. Multiple ancestral scenarios might be valid now more than ever. None to be ruled out in advance. Decreasing the odds of any clearcut interpretation based on deductive logic. Hi Fonte Felipe, I have just stumbled across your website whilst starting to research my ancestry. I just wanted to compliment you on your hard work and dedication for your subject. As a beginner I have found your site to be a great resource that I will be referring to in the future. I have not ordered a testing kit as yet, I was thinking about going with ancestryDNA but your previous comment regarding the September update is making me think twice. Has the issue been fixed? or should I try another company? Thanks so much for the kind words Wendy! I am always gratified to learn my website can be useful for others in their ancestral quest! I have personally only tested with Ancestry as well as 23andme. I think both companies do still offer good products. As I myself have learnt a great deal despite shortcomings and sometimes disappointing updates. Choosing between either one of them would depend on what exactly you’re looking for. It used to be the case that Ancestry offered a far better analysis of especially West & Central African DNA. However given recent updates on Ancestry this may no longer be true indeed (until perhaps a new update?). Ancestry may have the upperhand still when considering their customer database which is over 10 million now and still growing. This should increase the odds of receiving African DNA matches. Generally speaking they are also more specialized in family tree research and offering services/tools to assist you in such endeavours. 23and me on the other hand has the advantage of providing chromosome paintings, phasing with parents, haplogroups, and known ancestor birthplaces of your dna matches. Aside from their health reports of course. So really it’s up to your own preferences in this regard..
My bf got just got his 23andme results back and we noticed that he shares large segments of his dna with people from puerto rico, trinidad, Panama and Jamaica. All of which are listed as 3rd and 4th cousins sharing all 4 sets of grandparents. Does this mean that he has roots in these places? The rumor in his family was that there was some roots in the Caribbean but we didn’t know if it was true. Comparing family trees with these matches would be the best thing to zoom in to a MRCA (Most recent common ancestor). But generally speaking DNA matches can imply more than just one ancestral scenario. Assumptions about the direction of gene flow may be proven wrong after follow-up research. Context is everything and historical plausibility combined with solid genealogical research should be leading. Hey I just thought I’d share my results with you as someone of half Trinidadian/half-African American descent. 34% Cameroon, Congo, and Southern Bantu peoples. 32.1% Ghanaian, Liberian, and Sierra Leonean. I can post my other’s results too if you’d like. She was born in Trinidad to Trinidadian parents. Hi Bryce very interesting! Thanks for sharing, I would love to see your mother’s results too. Is she also on 23andme? If so it would be great if you could perhaps also send a screenshot or a viewing link (via the share button on your ancestry composition page). As I intend to start up a new survey of updated 23andme results for West Indians. Also would you know anything about where her grandparents and their parents were born? I’ve been in contact with several Trinidadians and i found it striking that many of them have either parents or grandparents who were born on other islands. Hi Feiipe I have received my Ancestry results back, both my parents and great grandparents were Trinidadian. Here are my results.